Gift cards can be used at any of our store locations as well as online. They can also be used for merchandise and for any of our cooking classes. 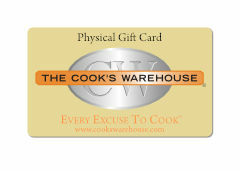 A Cook's Warehouse Gift Card that can be e-mailed to you or to anyone you know. Just select the amount (minimum $10) and enter the delivery e-mail address and your gift message - and we will email it out within 12 hours. Click here to check your cards current balance.